We want to thank all of our members and publishers for sharing your gratitude last week. 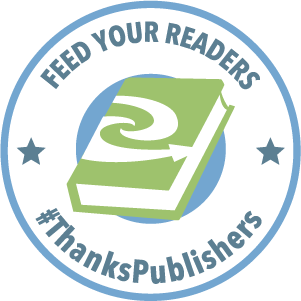 Your posts on Twitter and Facebook using #thankspublishers reached over 450,000 people and clearly demonstrated how amazing the NetGalley community is! Curious to see what others said? Click to view comments from both members and publishers on Twitter and Facebook – and if you haven’t already, feel free to join the fun! It’s our tradition to take a moment at Thanksgiving to thank you for your loyalty and support. We are grateful to have a dedicated community of readers, reviewers, recommenders, and book-champions. Look below to see the impact NetGalley members have in making new books successful! You can pass the Thanksgiving goodwill along by thanking publishers who use digital galleys. Post a thank you message on our Facebook page, or on Twitter using #thankspublishers. We’ll collect and share each “thank you” on your behalf. The NetGalley community is now over 210,000 members! Since the start of 2014, nearly 1,500,000 books have been read through NetGalley. Nearly 400,000 reviews and recommendations have been submitted so far this year. Your participation in NetGalley has helped to place great books in bookstores, academic courses, schools and libraries across the country. And perhaps most importantly, enthusiastic readers like yourself have discovered new books, fallen in love with spell-binding stories, learned about a timely or relevant topic, and become life-long fans of new authors. It’s a pleasure and a privilege to help you discover new books. On behalf of our team (and the 300+ publishers and hundreds of authors who use NetGalley), thank you!